So I've realized that in the past few weeks we've published ten new patterns and I haven't written about even one of them. I'm pretty awesome at self-promotion if you couldn't tell. I won't tell you about them all at once because that would be a very long and boring post so I'll just drag it out nice and slow over the next few weeks. This is Bellis, a slightly slouchy hat knit in the round from the bottom up. It has a ribbed brim and a plain stockinette body that is punctuated with tiny flowers. Bellis is the scientific name for the daisy, which is what this stitch reminds me of. Pattern includes detailed instructions on how to make the flowers and options to customize the fit. It can be made bigger or smaller, and more fitted or slouchier. 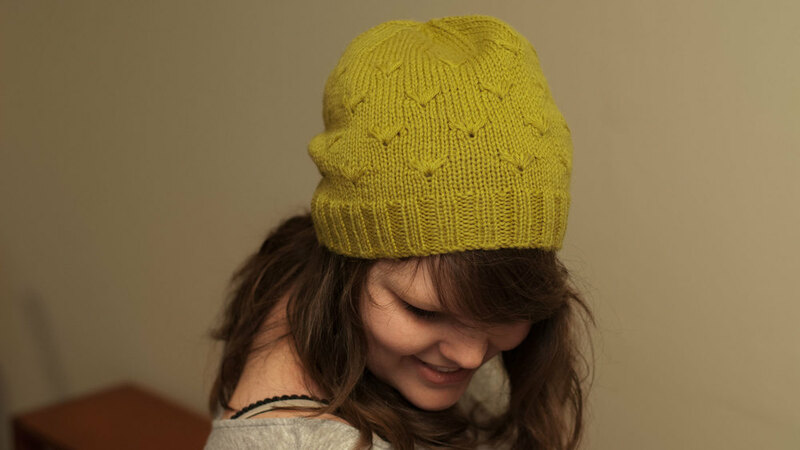 Rhomboid is a slightly slouchy hat, knit in the round from the bottom up. It features a wide, ribbed brim and geometric rhombus relief design using knit and purl stitches. The design is carried through the crown for seamless decreases. This pattern also includes instructions to customize the size (Thinner/Wider/Taller/Shorter) so you can make your perfect fit.